Lead is readily cast, rolled, machined or otherwise made to serve as shielding in the form of sheet, plate, brick, slab and so on. Our pure lead sheet is free of voids and characterized by a smooth finish, homogenous dense structure and uniform overall thickness. Because of these factors, our lead sheet has the ductility to conform easily to contours and is easy to handle on the job. Compositions of ingot lead (raw form) are listed in Federal Specification QQ-L-171 and ASTM B29-79. Ray-Bar only utilizes domestic material meeting Federal Specification QQ-L-201f, Grade C and ASTM B749-85, Type L51121. 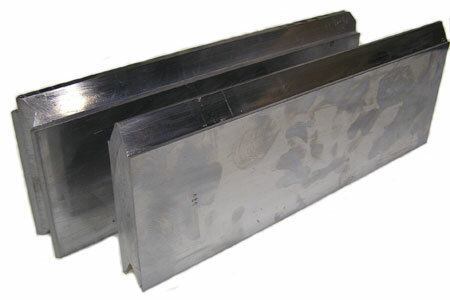 Lead occurs in nature principally in the form of galane which is usually associated with other metals such as zinc and silver although other elements such as gold and copper can also be associated with ore.
Ray-Bar’s Interlocking Pure Lead Bricks utilize 99.9% pure lead to provide maximum radiation shielding attenuation. The high pure lead content greatly reduces potential impurity "activation" and allows the end user to easily install new or retro-fit shielding applications for high energy x-ray or gamma radiation protective shielding. It also provides an interlocking NCRP compliant overlap to prevent gap radiation scatter leakage at both vertical and horizontal joints between the individual "brick by brick" radiation barrier assemblies. Tube steel or "I" beam vertical supports may be required to support overall lead brick wall barriers. This should be reviewed with your project’s licensed structural engineer for specific design criteria. Please note: lead does not shield against thermal or fast neutrons (See Ray-Bar Neutron Shielding Boron Loaded Products or High Density Concrete Materials). Ray-Bar Engineering is the foremost leader in the design and manufacturing of x-ray protection and radiation shielding materials. For more than 70 years, we’ve been providing the medical healthcare industry with superior x-ray protection products, radiation shielding designs, systems, and materials. Maintaining perhaps the largest inventory of shielding materials in the U.S. allows Ray-Bar to retain a continuing reputation of prompt deliveries for all our products domestically and globally.